Directions: Once in Albuquerque, follow I-25 to the other side of the city. Take Exit 234 Tramway Road. Follow the Tramway arrive at the Sandia Peak Tramway parking lot. 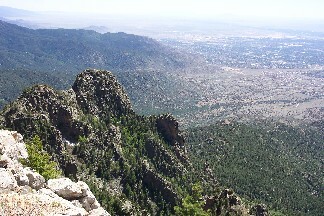 Aside from offering a panoramic view of the city of Albuquerque and surrounding areas, the Sandia Peak Tramway is also a thrill to ride in its own right. 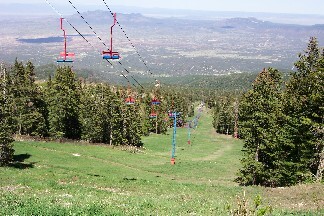 About three miles of continuously traveling upward via suspended cables, the tramway allows visitors to view the whole Sandia Mountain Range from a bird’s eyes vantage. Visitors are transported up and down the mountain peak hourly by trams. Each tram can hold up to 30 people. Once the tram starts to move upward, it rocked gently and one can’t help but to hold on to the handrails. Once it is off ground, the tram moves steadily upward. When it reaches the summit, where a large metal station is fixed, a whole new view opens in front of the visitors. From this metal station, visitor can view the whole section of cable dangling in the air unsupported in between the peaks of the two mountain ridges. The part that’s without any support is about two miles. Many visitors gasp with awe at the sight of it. Many grab hold of the rails tightly. It is a really unique and exciting experience. At the mountain top, visitors can enjoy many different activities. Several mountain trails lead through the forest, where patches of snow can be seen even into the early summer. It is recommended that you take a sweater or light jacket, as the temperature at the top is appreciably lower than at the base of the mountain. The return trip is quite exhilirating as well, especially when the tram just starts to move. It seems to fall several feet before pulling the cable taut. Each ride, you can hear some small cries from the visitors. 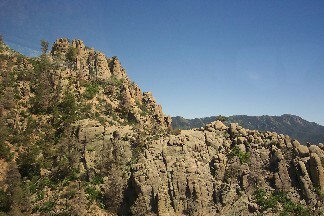 The Sandia Peak tram is a breath-taking view and awe-inspiring experience, and well worth the trip.